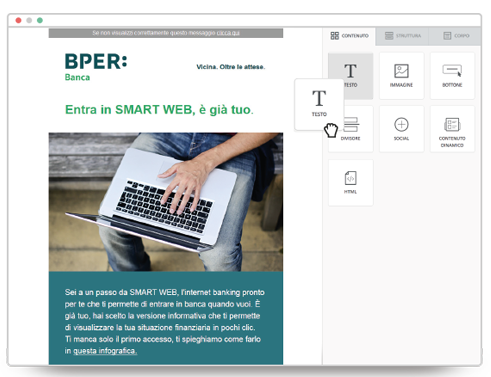 With its 770 branches across 18 regions of Italy, 8,000 employees and 1.4 million customers, BPER Banca is a bank belonging to the BPER Group, which is currently ranked the sixth banking group in Italy. It currently has four independent commercial banks which are each well-established in their respective areas. In addition to banks, the Group is also includes multiple product and instrumental companies. A key pillar of our digital ecosystem was the email channel: we wanted to get off on the right foot with a professional and dedicated platform. The results have been positive since the very first mailing; today emails increasingly contribute to BPER Banca’s marketing and positioning initiatives. launch multi-channel communications to give exposure to its rebranding. sending a recall email to all recipients who did not open the first communication. The campaign led to a clear boost in results, with a 7% increase in active online banking users compared to the same period in 2014. Thanks to MailUp’s statistical reports on benchmarks, BPER Banca was able to weight itself against the averages for the banking sector. The result? A 42.1% higher opening rate than the average of its competitors, and a 12.7% higher click through rate. Create a consistent flow of communications which engages all business channels and tells the story of your brand. Customize your campaigns based on your recipient and their needs, combining segmentation filters and triggered messages. Monitor the behavior of your recipients, both before and after the mailing: with A/B testing and statistical reports, you can find out which content and graphics are most effective for your campaigns.